pressure in the wate suPPly pipeline exceeds the preset pressupre of the relief valve, the relief valve will open automatically for quick pressure relief to protect the pipeline safety. It can also be used as a pressure maintaining valve to maintain the upstream pressure of water suppily of the main valve. 1. It can keep an unchanged and safe set pressupre accurately; in the event of over pressure, the relief valve will open quickly for timely pressure relief. 2. 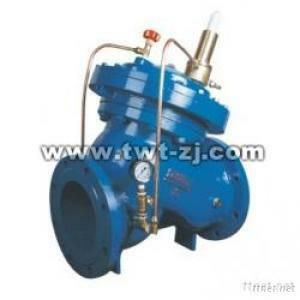 It boasts stable and reliable shut to remove the pressure aftereffect.